The statue of emperor Trajan, who ruled Rome from from 98 to 117 AD. The extravagant, imposing statue of Trajan was discovered by researchers from the Excavation Committee of the Ancient City of Laodicea, a project led by Pamukkale University archaeologist Celal Şimşek, reports Hurriyet Daily News. 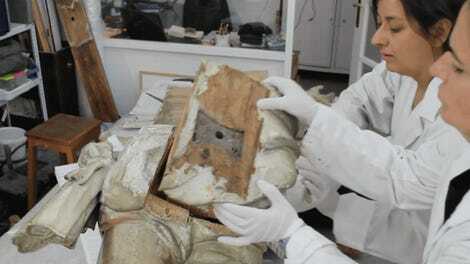 The 1,906-year-old statue stands at an impressive 3 meters tall, which is just shy of 10 feet. The statue was reconstructed from hundreds of pieces found clustered together beneath an ancient water fountain. 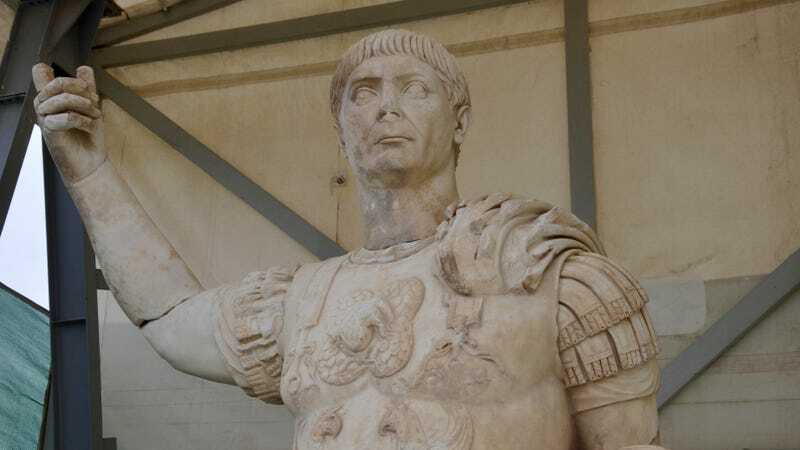 The statue features Trajan in full military regalia, including decorated body armor, a short chiton (the Roman equivalent of a Scottish kilt), and a cloth falling from the left soldier. A bound enemy soldier can be seen cowering behind the victorious Trajan, who strikes a domineering pose with his right arm in the air. The statue was completed in 113 AD, just four years before the emperor’s death. The statue was reconstructed from 356 pieces. During his 19-year reign, from 98 to 117 AD, the soldier-emperor Trajan expanded the Roman Empire to its largest extent, a vast region that included much of Europe, North Africa, and swaths of the Middle East, including Mesopotamia (now Iraq). Trajan contributed to the Empire in other ways as well, launching large public works that included the construction of aqueducts, bridges, and harbors. Laodicea was in the province of Phrygia (the bound prisoner is wearing a Phrygian cap), located on an important trade route that brought it great wealth and prosperity. It was so rich, in fact, that when an earthquake destroyed the city in 60 A.D., the residents refused any aid from the empire and rebuilt it with their own funds. They rebuilt it in grand style, its most prominent citizens sponsoring the construction of theaters, baths, temples, a stadium and a myriad other public buildings and works of art. It was granted free city status under [Rome] making it autonomous and self-governing. It even minted its own coins. The earthquake that presumably toppled the statue shattered it into 356 pieces, which were subsequently buried beneath a fountain where the monument had stood. According to Hurriyet Daily News, Trajan built a waterway in Laodicea, and he poured a substantial amount of money into the city; the statue was meant to honor Trajan for his many contributions. The statue is of unusually good quality, Şimşek told Hurriyet Daily News, featuring detailed and intricate facial features. He believes the statue was likely sculpted by an artist who saw Trajan in person. Various images on the armor are also visible. “On the upper part of the armor, there is the thunder of Jupiter, the celestial god of thunder. Medusa is located right in the middle of the chest, which is important because it shows the emperor’s frightening side,” Şimşek told Hurriyet Daily News. “There are two reciprocal griffons [a legendary creature with the body, tail, and back legs of a lion], which are the symbol of the god Apollo. We see Apollo as the god that protected the fine arts. With this, what...comes to mind is that the emperor did protect fine arts at his time,” he said. The archaeologists also found an inscription of the Roman Water Law at the same location—a document detailing the various rules and penalties concerning the use and treatment of fresh water at the time. A Little TLC Will Get This Honda 600 Back On The Road. Well, No.